The Department of Interior released its final environmental impact statement for Bechtel's Soda Mountain Solar project and appears to abandon previous "landscape-level" planning. 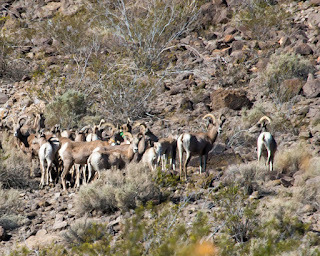 The document signals imminent approval for the nearly three square mile project that could ironically make it more difficult for desert bighorn sheep to adapt to climate change and imperil an endangered desert fish, ignoring alternative locations for the solar panels on rooftops or already-disturbed lands. According to the environmental review, the desert habitat that will be destroyed to make way for the Soda Mountain Solar project currently hosts as many as 142 different species of native plants, 13 reptile species, and 15 mammal species, including three species of bats that forage on the site. Fifty-one different bird species have been documented using the habitat, including burrowing owls. Biologists found 50 recently active owl burrows on the project site.